Catherine is just a wee tad excited! THANK YOU, THANK YOU, THANK YOU!!!!!!! I went right to eBay and bought it!!!!! Tami, you are an angel!!!! Thank you so much for your wonderful service!!!! My son will be so thrilled! 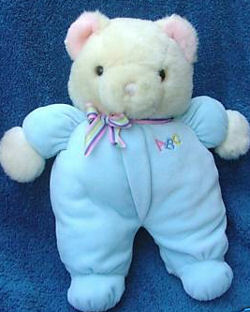 I am looking for an Eden bear wearing a blue velour sleeper with ABC embroidered on the chest. My son received it as a gift when he was 2 (12 years ago!). “Squishy” is a member of the family and is in desperate need of a new body. I would soooo appreciate any information anyone has regarding this teddy bear!!!! THANK YOU SO MUCH! What a great service this is online! I would appreciate any information anyone has regarding this teddy bear!